These 700×40 Schwalbe Marathon Duremes have several hundred miles on chip seal, smooth asphalt, gravel, and dirt. Just look at the little rubber nubs (is that the right word?) still standing there proud as your cat at the back door with a bloody bird at its feet. There’s a ridge nub running down the center of the continuous middle tread, and amazingly it is still there. I agonized over the purchase of these tires because I thought they’d feel lifeless and horribly slow. But I eventually pulled the trigger because I thought they looked right. I wanted some wider tires on the Quickbeam than the 32mm Pasela tires I had. I needed some volume for comfort and control, and wanted some tread because I thought it might help on the gravel climbs a little. I also thought they would make my gravel-leaning, fixed gear all-arounder look a little more ruggedly handsome. I might as well just come right out and admit it. Looks are important. They might not be as supple and fast as a Grand Bois tire, but they don’t seem dead or horribly slow either. In fact, to my senses, they feel good on gravel. They have what I’d call a comfortable, stable feel. These Duremes are also tough, and probably just as important as anything else, they LOOK tough. Because when you are no longer a slave to performance, you can enjoy looking cool. Chip seal is an elegant paving, So rarely done in these parts. An emulsion of sorts then rolled with 3/8 stone or like. Kind of just left. To find it's time..I'm new to this medium … Kenda Kwest's are rockin it. The picture is really cool.But, you agonize over the purchase of bicycle tires? Oh, wow! I appreciate this kind of simple consideration. 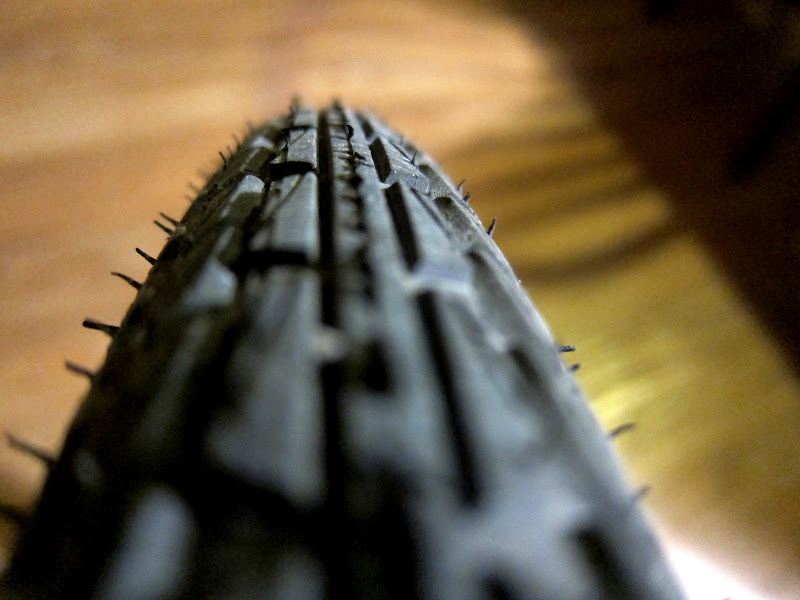 Your tires are the only part of your bike that touch the ground when you ride, so agonize away. Well, let's just say that "agonize" is my artistic license word for "gave it some thought". Fortunately, God has spared me a great deal of agony in my life. Several hundred? Just getting broken in! I keep hearing how good these tyres are but they are plenty expensive in Canada. My Kenda Small-Block 8's still work well for me because of their traction on snow and ice. I'd love to hear your review on that Pondero, alas I realize its not likely forthcoming (you're in Texas, correct? ).Still, I may shell out for Schwalbe's one day and I will keep your positive comments in mind. I have to say I think they are some of the cheapest tires around when put into perspective. I've been running Schwalbes on four of my bikes since 2007. I've never had to fix a flat or replace a tire yet. Several pairs have 5,000 plus miles on them. You get a heck of a lot for the price. Too soon to form an opinion regarding puncture resistance. But I will say that I haven't experienced any punctures yet. Fortunately for me, I seem to ride in an area that is not very puncture prone. Or at least I did until I typed this reply. @Wilson – For Canadians, the best (cheapest) source of schwalbe tires I have found so far is chainreactioncycles.com in the UK. They ship free over a certain price point and consistently beat Canadian and US prices.I have no business relationship with them and won't receive a penny for saying any of that, by the way.